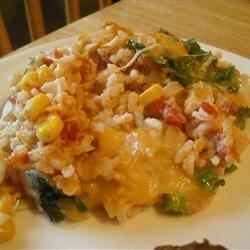 "Baked rice with cheese, diced chiles, cilantro, corn, and sour cream. Would be great served with green enchiladas!" See how to make easy, tasty Mexican rice. This turned out ok. It had an interesting flavor, but my husband and I had hoped it would be creamier. Next time I may add more sour cream or some salsa to it as well. This was absolutely delicious...the only thing I did differently was to use instant rice, it was fantastic...this recipe is going to be a keeper for me! Easy to make, tastes great. I added extra sour cream and cheese and topped with black olives. Delicious!